This paper presents the use of an optical trapping tool known as an optical tweezer which is generated by a nonlinear microring resonator circuit. The input waves (lights) can be in the forms of soliton or Gaussian pulses, where the particles can be trapped and moved along the center ring, in which the tunneling particles can be generated and confined within a center ring by the whispering gallery mode (WGMs), which induces the nonlinear coupling effects by the two side rings. 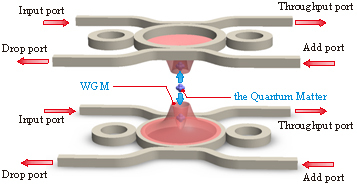 In application, the tunneling particles/charges/ions can be stored and confined within the device, where the concept of quantum matter or magnetic monopole can be realized. By using the particle injection, the required material can be applied for metal, liquid or gas, where finally, the quantum matter (fluid) can be formed.